I'm Thankful This Holiday Season! -My husband, Johnny. Without him, I'd be lost! He's patient, supportive, and kind, and I am always grateful to have someone behind the scenes, rooting me on in this business. -My family and friends: They are truly the foundation of everything I do, and they keep me grounded. There are so many people in my life who have shaped me into the person I am, and they are abundant in my professional life and my personal life..what a blessed girl I am! -My business: I've said it time and time again, the young people I get to meet and work with, inspire me daily with their hope and aspirations. They are living life to the fullest, and taking risks, and they encourage me to do the same. Of course, this list could go on for ages! I have heard it is a good practice to write out three things you're grateful for, every single day, and I believe it. It has a way of resetting our hearts and priorities, and keeping us humble. 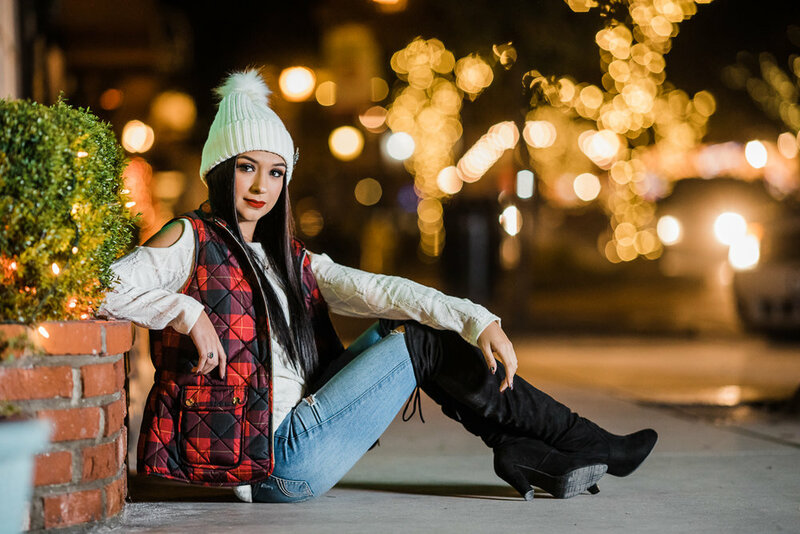 I'll leave you with these pretty, winter wonderland images of one of my seniors, Seyenna! She's so sweet and adorable, and she took my holiday inspiration, and nailed this styling (loved her buffalo plaid vest and festive hat!). We met up in Solvang, a charming little town that always has the best lights and decorations. Wishing you all a beautiful holiday, and thank you for being part of my journey!